Weigh-ins are complete for the first of two RIZIN Fighting Federation events this weekend and it did not go down without incident. Bantamweight Grand-Prix participants, Ian McCall and Manel Kape got into a physical altercation after stepping on the scale. Kape slapped McCall in the back of the head following their staredown and McCall retaliated with what looked like a stiff jab to the face. Kape threw a punch back, but McCall dodged it. Officials then had to separate the two men. McCall later stated that it was a slap and not a punch. 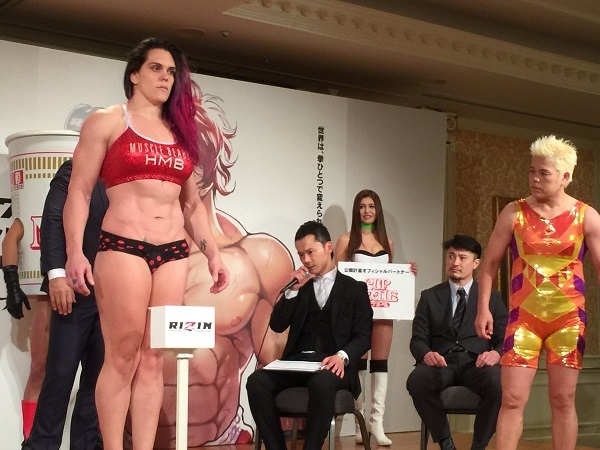 Brazilian Jiu-Jitsu ace Gabi Garcia weighed in at 12kg over the allowable limit which equates to more than 26 pounds. Garcia put her bout against 53-year old Shinobu Kandori in jeopardy. Although RIZIN President Nobuyuki Sakakibara was upset and said the fight cannot continue on, it appears as if it will. The fights take place at the Saitama Super Arena, in Saitama, Japan. The first, the RIZIN Fighting Federation World Grand-Prix 2017: 2nd Round takes place Dec 29, 1AM ET/Dec 28, 10PM PT and can be ordered and streamed below via FITE TV. The pay-per-view price for each fight card is $19.99 or you can order both and save for $29.99. 75.0 kgs (Elbow allowed) SATORU KITAOKA 75.0kgs / 165 lbs. KIICHI KUNIMOTO 75.0kgs / 165 lbs. 57.0 kgs SHIZUKA SUGIYAMA 57.0kgs / 125 ½ lbs. KANA WATANABE 56.95kgs / 129 ½ lbs. RIZIN MMA Special rules KIZAEMON SAIGA 62.60kgs / 138 lbs. KAI ASAKURA 62.70kgs / 138 lbs. 66.0 kgs HIROYUKI TAKAYA 65.95kgs / 145 lbs. AZJAVKHLAN BAATAR 65.75kgs / 144 ½ lbs. 70.0 kgs (Elbow allowed) KING REINA 70.0kgs / 154 lbs. CINDY DANDOIS 68.60kgs / 151 lbs. 93.0 kgs (Elbow allowed) JIRI PROCHAZKA 92.95kgs / 204 ½ lbs. KARL ALBREKTSSON 92.40kgs / 203 ½ lbs. 95.0 kgs GABI GARCIA 107.70kgs / 237 lbs. SHINOBU KANDORI 73.75kgs / 162 ½ lbs. Bantanweight GP QF1 KHALID TAHA 60.85kgs / 134 1/s lbs. TAKAFUMI OTSUKA 61.0kgs / 134 ½ lbs. Bantanweight GP QF2 KEVIN PETSHI 60.80kgs / 134 lbs. SHINTARO ISHIWATARI 61.0kgs / 134 ½ lbs. Bantanweight GP QF3 IAN MACCALL 60.45kgs / 133 lbs. MANEL KAPE 60.40kgs / 133 lbs. Bantanweight GP QF4 KYOJI HORIGUCHI 60.75kgs / 133 ½ lbs. GABRIEL OLIVEIRA 61.0kgs / 134 ½ lbs. Purchase below if you wish to watch just the first event. Purchase below if you wish to watch both events.